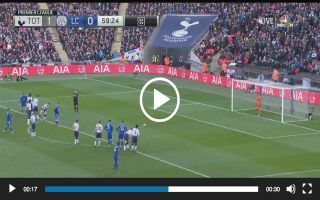 Leicester striker Jamie Vardy missed a crucial penalty against Tottenham this afternoon, immediately after being brought on as substitute for the Foxes. Claude Puel’s side were awarded the penalty after a scramble in the box led to a coming together between James Maddison and Jan Vertonghen. Maddison was all set to take the spot kick till Vardy entered the pitch, his first moment whilst on the pitch ended in disaster. The England international’s penalty was saved by Hugo Lloris and just like that the Foxes have lost their chance to come out of this game with something.